Anti-wolf proponents would have you believe that Wolves are rampant killers who take a couple of bites from a kill and rush off to kill again. The Wolves I have observed, don't fit this distorted picture. 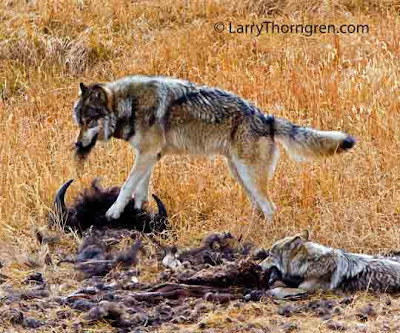 These Wolves have returned to a Bison they killed ten days before and are cleaning up everything, including the bones and skin. I got this photo because I know that wolves return again and again to old kills. I saw this pack of Wolves earlier in the day and set up my tripod and camera about 100 yards from the old bison kill. Sure enough the Wolves showed up to scavenge on the kill, unaware that I was hidden in the trees on a nearby hill. Love your blog and pictures. Can't believe the war on wolves. Where are all the supporters? New Englanders are freaked out by Coyotes that have taken up residence in the suburbs.